At Earth Scape, we know exactly what your Pensacola area lawn needs. Our courteous, trained professionals will work to make your lawn greener and more weed-free and give you more time to enjoy it. Our team specializes in lawn care services, tree and shrub care, pest control, irrigation and landscaping design. Keeping your lawn at it's best is our top priority. Our professional lawn care service gives you more time to enjoy your beautiful, pest-free lawn. Lawn maintenance for residential and commercial properties in the Pensacola, Florida area. Earth Scape provides the profesional lawn care maintenance to include: lawn cutting, hedge trimming, lawn edging, chemical maintenance, specticides, pesticides, lawn discoloration analysis, and more. We are a professional and trusted Pensacola Lawn Care Service Provider in the Pensacola area. What state is Pensacola in? Let us take care of your lawn and landscaping services so that you have more time to enjoy and relax in your home. With cooler temperatures in the morning, the water is more likely to enter the soil and not evaporate into the warmer air. Mowing is one of the most important practices. There are three main factor to consider. What are the pros of automatic irrigation systems? Aren't they wasteful? Click here to find out the answer. 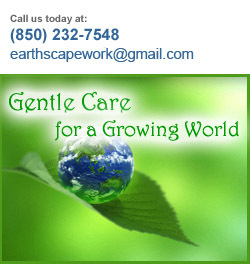 Earth Scapes is your Professional Pensacola Florida Residential Lawn Care Service Provider! We treat lawns, shrubs, and trees against fungus, mold, and insects. Residential and commercial services available in Pensacola Flordia. Call today for your Landscaping and Lawn Care Quote!